1984, the Reverend Fritz Lafontant and Dr. Paul Farmer, doctor, anthropologist and professor at the School of Public Health at Harvard University, open the Hôpital Bon Sauveur (Good Savior Hospital) in Cange (Plateau Central Haiti) to serve the local population impoverished by the construction of the Peligre hydro dam. 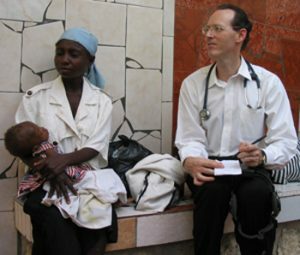 1993, Paul Farmer asks his friends, Christine and Patrick Murray to found an association in France to support the hospital in concert with Partners in Health and Zanmi Lasanté of Haiti. Zanmi Lasanté-PARIS (ZLP), an association established under the law of 1901 comes into being. 2001 – LAVI NOUVO, “A New Life” for the local families. In January 2001 Christine Murray visits Cange where the direction of the local schools ask for a program of formation for their teachers in French. Zanmi Lasanté – PARIS, inspired by the vision of a better life for the impoverished rural population, focuses on projects for the improvement of education, food security and development. Over the years specialists in agriculture and water management volunteer their services. Since 2004 – 2 Haitian Partners – ZLP helps Lénéus JOSEPH and Jean Robert SEJOUR, founders of peasant organizations and local schools. These two schools serve 900 pupils, from Kindergarten through High School.